Are you considering hosting a wedding ceremony in the Chicago area, but find the idea of a run of the mill, old-fashioned ceremony uninspiring? If you are looking for an unforgettable, beautiful, and enchanting experience, customize your wedding ceremony onboard one of our luxury yachts. A wedding aboard one of Anita Dee Yacht Charters‘s chartered yachts is truly a once-in-a-lifetime experience. At Anita Dee Yacht Charters, our hospitality specialists will work with you to create an elegant, personalized ceremony for you and your guests. Our team has the resources and experience to accommodate your wedding event planning needs. 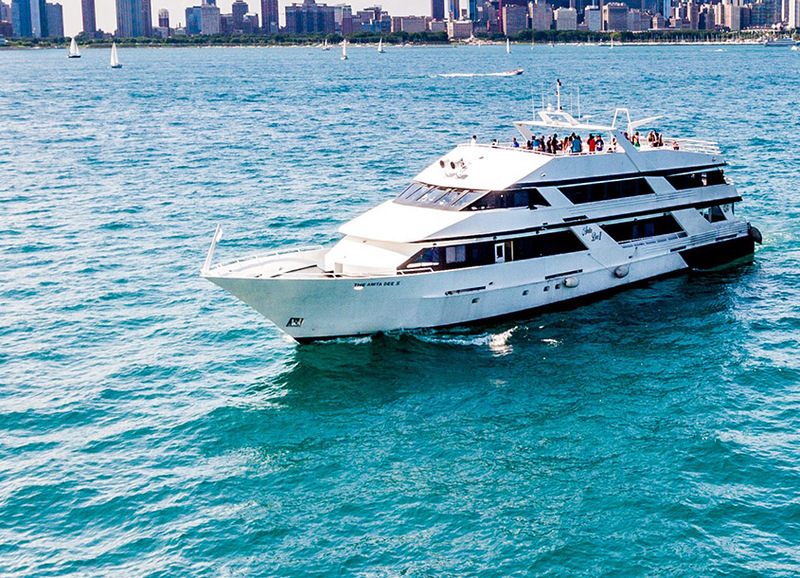 Our yachts can provide you with state-of-the-art entertainment systems and feed your guests with food prepared by Chicago’s best catering services. With four decades of experience, Anita Dee Yacht Charters can give you the custom-tailored wedding ceremony experience that you have been looking for. There is a reason why many of our clients return to us. We offer our clients a chance to embark on a totally unique and exhilarating adventure. Call our office today at (312) 379-3191 to set up a consultation, and we’ll create your perfect wedding ceremony. At Anita Dee Yacht Charters, we know how much you have been looking forward to your wedding. Our experienced team can match your vision with our hand-picked catering services, outstanding entertainment, and a full-service galley. Both of our yachts are docked in the heart of downtown Chicago. Your ceremony can be dockside or on the water overlooking Chicago’s historic skyline. Both of our luxury vessels, Anita Dee I and Anita Dee II, are equipped with elegant dining areas and spacious outdoor areas. If you are planning for a small gathering, our first yacht, Anita Dee I, can provide you and your guests with a sophisticated but intimate ceremony. This 90-foot, 120-passenger yacht is the exclusive escape to the wedding of your dreams. Do you dare to dream big? We can accommodate larger ceremonies as well. The Anita Dee II is a 400-foot, 400-passenger floating tour de force that will truly make your wedding ceremony an unforgettable experience. Our largest vessel is outfitted an exquisite piano lounge, a formal dining area, a wide-open observation deck, and a helicopter pad to boot. Both of our luxurious yachts are docked at DuSable Harbor in the Chicago River on Lake Shore Drive. However, our vessels can dock in other location on the Chicago River and throughout Illinois. No wedding ceremony is complete without delicious food. At Anita Dee Yacht Charters, our hospitality specialists have hand-picked some of Chicago’s best catering services. We will ensure that none of your guests will leave your wedding ceremony hungry. Your guests can satisfy their appetites with a specialized gourmet menu that you choose. Please contact one of our preferred caterers to directly customize your menu package. Anita Dee Yacht Charters can also accommodate any licensed or insured caterer not listed among our preferred vendors for an additional fee. Call our office today to set your personalized wedding experience. Top of the line entertainment is another important consideration when hosting a one-of-a-kind wedding ceremony. Along with five-star catering services, you can dazzle your guests with unrivaled entertainment. Like our catering services, our hospitality specialists have selected Chicago’s preferred entertainment services for your convenience. Both of our vessels are equipped with the latest ultramodern sound systems that can provide music throughout the vessel. The musicians on our entertainment page have entertained guests aboard Anita Dee Yacht Charters for many years. Do not hesitate any longer! Your unforgettable wedding experience is only a phone call away. What can be more exhilarating than to sail past Chicago’s majestic skyline on your wedding day while onboard an elegant yacht? At Anita Dee Yacht Charters, we have four decades of experience in providing expert customized services to our clients who seek an adventurous and unforgettable wedding ceremony. We will work with you to design a personalized wedding experience that fits your personality and tastes. Contact our office at (312) 379-3191 to learn more about your options and what we can do for you.